Ossus, Adega System, Auril Sector (Grid S-6, 350.300.2) Pre-Cataclysm Ossus was a lush, rich world, originally settled by the Jedi Order (ref# 2389101) and its dependents est. 25,000 BBY. Considered one of the templeworlds of the Jedi Order throughout most of the Old Republic's history. Ossus's environment and surface was devastated in the Cron Cluster Supernovae (ref# 2389-12893-2389). Pilot planet under the Ossus Project circa 24 ABY (ref# 23491-2139). Near-Human stock, the Ysanna. Descendents of the original Jedi colonists. Recent resettlement by the Jedi Order and support units (see Antarian Rangers (ref#3201-3829) and Freedom Sons (ref# 3201-3830) has brought a mix of force sensitive races to Ossus. The Ysanna tribes are pre-industrial; increased contact and developmental assistance with the Jedi Order has risen their technological advancemet. The colonists and native Ysanna tribes rever and use the Force (ref# 102-1991). Slen'da took a deep breath as he awaiting the Solusar's consultations with each other. He let it out through his mouth. The smells and sensations of home. Well, a home. The planet was heavily embued with the Light Side of the Force, even after the cataclysm that had befallen it. Slen'da looked far out, towards the horizon and the far mountains. The Temple was situated between a steep mountain ridge and a deep valley, offering a panoramic view across the valley and into the distant mountains. Here and there, he could see the lights of modest dwellings scattered amidst the checkered farmlands and pastures of the Yvanna community. The Jedi Temple was set amongst the lands of the Yvanna. A friendly Force-Sensitive people, the Yvanna had a established and positive relationship with the "guests" and cousins, the Jedi Order. In turn, the Jedi Temple helped the Yvanna rediscover their roots. While it was on Yavin IV that Slen'da had first enjoyed exploring and discovering items and artifacts of ancient eras, it was here as a Knight that Slen'da discovered his passion for archeology. Thousands of years of Jedi had lived and grown on the planet, all of that ruined in a day thousands of years ago. But it was among the ruins of the Jedi culture that Slen'da had found that passion, and so to him, it was home. The native population as well as family members the Jedi both near and far participated in the strengthening of the community and the operations of the Temple. The Pathfinder had been guided down by Yvanna ground controllers, while the recognizable offspring and spouses of Jedi offered or nodded greetings as they carried datapads, organized droids, or carried items through the Temple's corridors and among it's many rooms. He recognized the Whipid Master K'Khruk as he ambled by, wearing his infamous conical woven hat. A group of Padawans trailed behind them, obedient and smart on their way to lessons. He never forgot his Bothan upbringing on Kothlis, but Ossus was always his second home in a way that Yavin IV could never be. He thought more. 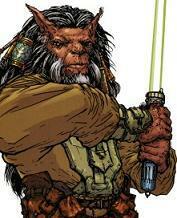 It was different to be a Bothan Jedi compared to a Human Jedi, that much certain. He turned from his reverie to the Jedi Librarian and her husband, the Master of the Temple. Kam and Tionne Solusar had always exuded a quiet sorrow behind that quiet dignity. Their calm, quiet, sad eyes looked into the Bothan's own. Master Solusar spoke. "Dark is the tale you tell, yet darker are the shadows in the Force that surround it. Tionne knows best about the thirst for knowledge, and the capacities of those who would seek any means to attain it." Slen'da interrupted, his fur ruffling in impatience.. "Well, we've known that Aach Een is an unscrupulous being. His sense of independence and self-determination goes beyond the normal spectrum of an Iridonian. This attack proves that." Tionne raised admonitory fingers had him. "Yet, no one has yet mentioned that he is the leader of the attack, or even one of those that ordered the deathmarks on your friends and colleagues. Een is always the agent of others. Despite the deaths of your friends, bringing the individual murderers to justice will not defeat the larger shadow behind this plot. Yet Een is the link; through him, you will find those who truly ordered the attacks and the deaths of so many innocents." Solusar took up the thread. "I sense great anger in you yet, Corask. That is not the way of the Jedi, even in these late times. You must find Een and his master, not concern yourself with the instruments that they used to disguise their real intentions." "The Centrality is remote from galactic affairs, yet the shadows of the Dark Side are falling even there. With the return of Grand Admiral Zend's forces from the Unknown Regions, instability has plagued the Galaxy. They are not Sith; yet they represent the greatest threat to peace and stability since the end of the Civil War." "The waves of death and pain from untold suffering is already reverberating through the galaxy, through the Force. Go carefully, Jedi Slen'da, and do not deviate into the shadows of fear, pain, and vengeance that surrounds you and your path." Slen'da left the meditation chamber, a tranquil bubble-shaped room near the pinnacle of the Temple complex. He needed, somewhat desperately, to purge the feelings of anger, remorse and frustration at the events of Rafa V, and in his point of view, the complete lack of progress in tracking down the raiders. A 3-PO droid came up to him as he walked down the corridor. "Master Slen'da, Master Solusar would like to see you in her suite." Slen'da nodded his thanks, and moved on. When he arrived, he was let in immediately. Tionne was there, alone. She was gazing out at the distant valley, but turned her chair toward him and rose to greet him. "Greetings Corask. How is your search today?" Slen'da's fur along his ocular bone flattened; a sign of frustration. "No new developments. The Centrans are too busy suppressing the rights of the Renatasians to fully pursue the true killers of the Rafa V researchers. I don't know where to start from here." Tionne frowned, not at the news, but at the tone of bitterness in Slen'das voice. She chose not to comment on that, however, but on a recent development. "I see. Well, Master Slen'da, I think we may have a new task for you. There has been a strange theft at the Tenandro Arms facility on Kelada. Due to Baron Calrissian's relationship with the Order, he has made a request to Master Skywalker to send a Knight to investigate. Master Skywalker agreed, and I have followed my feelings in the Force on this matter and selected you for this task." Slen'da was surprised and angry. "I had not planned to be available for Order business. I have meant to take a leave of absence to track down these killers myself-" But Tionne raised a single hand, silencing him. He glowered. Tionne continued as if he had not spoken. "My meditations in the Force tell me that there may be more to this theft from Kelada that meets the eye. Master Calrissian's goals and your own may coincide." Her eyebrow raised sardonically. "Besides, if you don't know where you want to go, then it doesn't matter which route you take."